Kym believes a balanced and healthy diet combined with a regular exercise regime that you enjoy will give you not just immediate but long lasting results. Kym will tailor a training plan according to your needs and the flexibility of doing the workout when and where you decide means no excuses not to work towards that new you! Whether you want to lose weight, tone, strengthen or even be able to run that 5k, 10k or even marathon race, Kym can tailor a plan to achieve your personal goal. Kym Bailey, Head Trainer at 7 Mile Fitness, is an inspiring individual who has embraced a fitness lifestyle and never looked back. 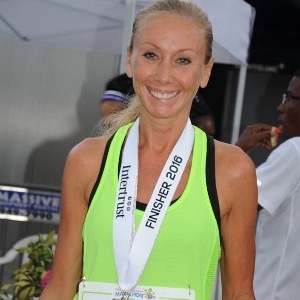 On the athletics side Kym has achieved tremendous success in just a short period of time, winning the Cayman Islands Half Marathon, and ranking towards the top of her age group in both the Chicago, Boston and New York Marathons. Kym is an ISSA qualified fitness trainer and running coach who is dedicated to helping clients make the transition into the best version of themselves through nutrition, fitness and wellness. Kym trains people based all over the world virtually having regular video chats through Skype, WhatsApp or whatever works for you. Being held accountable to your own goals is what makes it work and her athlete testimonials are heartfelt. Kym is always happy to have that initial converstion so don't be shy! Success. Coach Kym Bailey has been notified of your message.